DeWalt brings its compact routers to a new level with the new DeWalt DWP611PK 1.25 HP compact router kit. Since it comes with both a fixed and plunge base, users will be happy with its versatility. Don’t for a moment think that its compact size means that features and power were sacrificed either. We were surprised to learn that this pint sized router packs a punch and does a fantastic job at a wide variety of router tasks. At the end of the day we concluded this is a great woodworking tool. Our DeWalt DWP611PK 1.25 HP compact router kit arrived in a cardboard box with everything individually packaged inside. The kit includes the DeWalt DWP611 compact router with fixed base, plunge base DNP612, collet wrench, soft sided nylon storage bag and the owners manual. We were just a little disappointed when we found out that this kit did not come with a hard shell case. Somehow we tend to think of a routers as a precision instrument that needs some place to keep it protected and organized when not in use. The very top portion of the routers body is made of DeWalt’s standard yellow ABS plastic. The on/off switch is located on the lower side of the plastic housing. A nice feature about this switch is that it has a clear rubber protector that seals it from wood shavings and dust. Located right above the power switch is the variable-speed dial that allows you to adjust the RPM from a minimum 16000 to a sweltering 27000 RPM maximum. The soft start, 1.25 HP motor that is housed inside is designed with air vents on the top and bottom that direct air flow over the motor to help keep it cool. The main body of the router is made of machined aluminum that helps to give a good level of precision and lightweight characteristics. To swap bits out, there is a easy-reach button that when depressed locks the spindle so the collar can be loosened. There are 12 detents on the spindle shaft which means faster lock ups for quicker bit changes. The collar is extended a 1/4” longer then normal for greater gripping surface area too. To give more visibility when working, two bright LED lights on the bottom of the motor assembly light up when the router is turned on. The removable fixed base is very compact and, being that it’s made of aluminum, it hardly adds any weight to the router. This base makes it easy for the user to have a firm, comfortable hold on the tool. Thanks to tight tolerances between the base and the motor assembly and a very positive locking mechanism, you can be sure that once you dial in a depth that it stays locked until you loosen the lever. There is also an adjustable ring that screws up or down on the large threads on the router body so that you can get very precise depth adjustment. The D-shaped 1/4-inch thick clear plastic sub-base is designed for stability, flatness and visibility. Removing and swapping the fixed base for the DeWalt DNP612 plunge base is a cinch. Just release the level adjustment level lock, slip the base off, and slide the new base on. On the side of the plunge base there is a quick release for adjusting the cutting depth. The plunge base is a little larger than the fixed and, with it installed on the router, the total weight is 6 lbs 10oz. This added weight actually makes the router feel more sturdy and sure as you make plunge cuts. The large quick release lever, when depressed, offers smooth and fast depth adjustment. When the lever is released the base is then locked to that cutting depth. To make sure the cuts are precise, there is a sliding steel bar that can be adjusted for making plunge cuts up to 2” deep by loosening the large thumb screw located next to it. There is also a 5-step adjustable turret stop for consistent stepped cuts. The hard nob-like rubber handles are very comfortable and provide a solid hold on the tool. This plunge base provides very smooth and stable plunges and offers precise depth cutting. To test the DeWalt DWP611PK 1.25 HP compact router, we used both the plunge base and the fixed base to make a variety of different cuts. We started by using the fixed base with a new 1/4-inch round-over bit to create a finished edge on a piece of 1×4 pine. We found the router made a smooth, even edge and was easy to control thanks to its compact size (a fact that also meant we were able to simply “palm” the tool). We were also happy to find that it did an exceptional job of clearing away the shavings which, along with the LED lights, gave us plenty of of visibility. One of the features that we noticed is that this router utilizes a soft start motor. When we first switched it on, the motor slowly ramped up to the desired speed. “Slowly” being defined as just a few tenths of a second versus an instant on, where it could potentially be a little jerky since you would experience the full torque of the motor instantly. Depth adjustments were easily made and required no tools. All we had to do was open the quick release latch and then we could freely make fine tune tweaks using the adjustable ring. The fixed base also worked great for doing large edge profiles and heavy flush trimming. Since the router with the fixed base attached only weighs 4lb 10oz we could use it for extended amounts of time without feeling fatigued. Changing router bits was a breeze since the large button can be actuated with the same hand that stabilizes the router, and – as we mentioned – there are twelve motor shaft detents, so the lock pin stops the shaft quickly. The variable-speed control allowed for us to change the RPMs for maximum efficiency when making various cuts in different kinds of wood. For one of the tests using the plunge base we made some plunge cuts and also stepped cuts in a piece of 1x pine and a piece of 1x oak with a 5/16x1x1/4 Straight/Mortising bit. We first tested the plunge base by making a straight cut in the pine board and then in the oak. When plunging into the wood, the router moved very smoothly and maintained a consistent speed when cutting both materials. The consistent cutting speed is actually attributed (per DeWalt) to the built-in electronic motor speed controller that continually monitors the speed and makes micro adjustment to ensure that it is running at the setting you locked in. The two LED lights on the bottom of the router combined with the clear plexiglass sub-base provided excellent viability, which in turn increased accuracy. We also used the 5 step turret on the plunge base to make stepped cuts. It made consistent, accurate cuts and was easy to adjust. The 5 step turret can be rotated by simply turning with your hand and the fifth step is able to be adjusted to customize the height with a flat-head screwdriver. This base also worked great for making interior cuts for flutes, inlays and mortises. The plunge base proved to be solid with plenty of features that improved performance and made adjustments easy to make. With power that is on par with some full-size routers, the DeWalt DWP611PK 1.25 HP Variable Speed Compact Router Combo Kit quickly becomes a do-all kit. 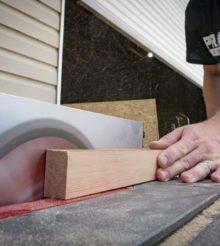 Sure, there are some applications where a larger tool is required due to the size of the bit or the profile, but for many regular tasks like roundovers, simple edge treatments, flush cuts, and furniture building, this router will quickly become a favorite thanks to its compact size that doesn’t sacrifice features or performance. For our Performance rating, we gave the router an 8/10 since it will allow you to accomplish just about any smaller sized router job and still be solid, comfortable and reliable. For our Value Rating, we gave the Router a 7/10 since it really does provide excellent value in that it builds in the versatility of having both the fixed and plunge bases included. Our only small grip is that it did not come with a sturdy molded case for storage and transport.